"We're brothers now." A new comedy from the people behind Saturday Night Live. Brother Nature is an indie comedy produced by SNL's Lorne Michaels, featuring at least four SNL cast members. The story involves a straight-laced politician named Roger, played by Taran Killam, who goes on a retreat to a cabin with his dream girl, played by Gillian Jacobs. But in the woods they meet his soon-to-be-brother-in-law, played by Bobby Moynihan, and his family, and things get wild as expected. Also featuring Rita Wilson, Bill Pullman, Ellen Bloodworth, Sarah Burns, Giancarlo Esposito, Rachael Harris, Kumail Nanjiani, Kenan Thompson and David Wain. This is chock full of really dumb humor that makes me wonder if it's going to feel like a very drawn out SNL skit that just doesn't work on the big screen. Have fun. 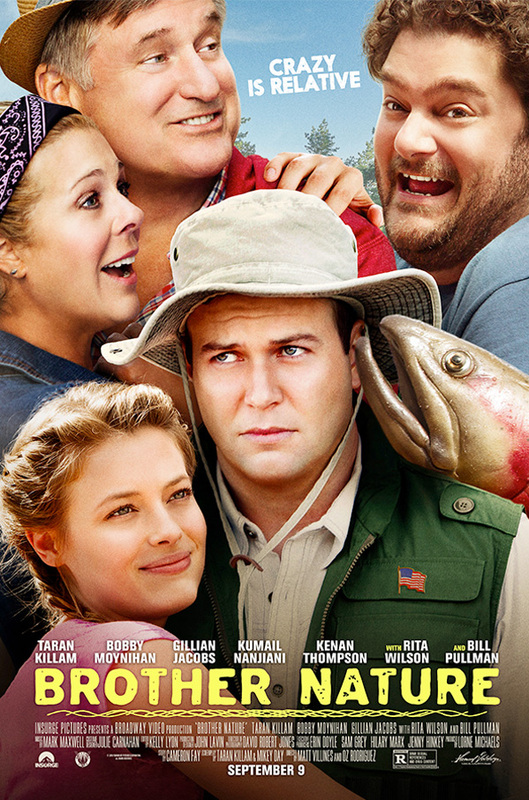 Roger (Taran Killam), a straight-laced politician has big plans to propose to his dream girl (Jacobs) at her family’s lake house. But everything goes awry when he meets his potential brother-in-law Todd (Moynihan): a full-time camp counselor with a heart of gold and a wild sense of fun, pining to be Roger’s best friend, and ultimately catapulting him into a series of unfortunate events. As Roger tries to take a stand amidst outrageous fishing excursions, propulsive water jetpacks and American history-themed musicals, he realizes that being a part of a new family may be more difficult than he'd thought. The film is co-directed by Osmany Rodriguez and Matt Villines (aka "Matt and Oz") of work on "SNL" and other shorts, produced by Lorne Michaels. Samuel Goldwyn opens Brother Nature in theaters September 9th. Looks like a perfectly harmless joint from Michaels and company. I am kind of glad he helps his people out. Okay, the skunk's eyes turning red made me laugh and I'm not sure why. Just me or does Bill Pullman look a little like Robin Williams in the poster? Substitute Ed Helms and Chris Farley (if he was alive, obviously). Would this be a better movie? I don't think you or anyone here has seen the movie, and thus I think it's a bit hard to ask if the movie would be better with different actors. Moynihan has a much different feel than Farley. Farley is a bit more bombastic whereas, Moynihan is more subtle with his humor. OT: It looks like a return to comedy, not the outrageous, man child, non-sequitur humor of Ferrell and friends. I think the Moynihan character will push the boundary, but not cross it. "chock full of really dumb humor that makes me wonder if it's going to feel like a very drawn out SNL skit that just doesn't work on the big screen" You just described nearly EVERY SNL alumni film of the last 30 years or so..
Holy crap.... this looks effing terrible.